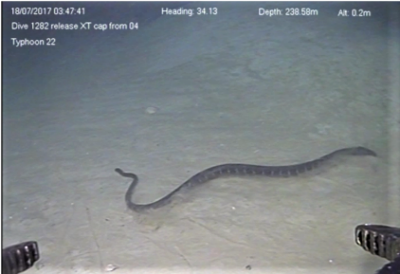 Footage of a sea snake swimming at 245 metres deep, and another sea snake at 239 metres has been provided to University of Adelaide researchers by INPEX Australia, an exploration and production company operating in the Browse Basin off the Kimberley coast of Australia. Both snakes appeared to belong the same species. Image: Record-setting dive of a sea snake swimming at 240 metres in the deep-sea ‘twilight zone’ taken in July 2017.